In the first quarter of 2019, Turkey-based YILPORT HOLDING, the 12th biggest global container terminal and port operator, ordered four high-performance Model 8 mobile harbor cranes for two terminals in Latin America. Two of the large Konecranes Gottwald cranes will begin operation in Puerto Quetzal, Guatemala, in mid-2019, followed by two cranes in Puerto Bolivar, Ecuador, just two months later.YILPORT’s four new eco-efficient diesel-electric Model 8 mobile harbor cranes from Konecranes will mainly handle containers in two terminals. Kalmar, a provider of lifting solutions and part of Cargotec, has announced a further extension of its collaboration with world-leading global terminal operator DP World.A new fleet of Kalmar mobile equipment - 33 terminal tractors, three empty container handlers, three reachstackers and one forklift - will ensure safe and efficient operations at DP World's new deep-water port at Posorja in Ecuador. The order was booked in Cargotec's 2018 Q4 order intake, with delivery scheduled to begin during Q2 of 2019. To address rapid increases in volumes APM Terminals Inland Services Ecuador introduced an accurate and reliable Truck Appointment System (TAS).This approach has already proved itself at other APM Terminals’ facilities, including neighbouring Peru. The system allows for much better co-ordination of arrivals and departures leading to significantly shorter wait times for trucks.The system now allows truck arrivals at the facility to be spread evenly throughout the day with a truck turnaround time of just 45 minutes. DP World, one of the world's biggest port operators, posted a 2.1 percent drop in first-half net profit on Thursday, and cautioned about geopolitical risks and recent changes to trade policies.U.S. The nationalization of a crude oil export pipeline in western Canada has buoyed long-standing hopes for crude exports to markets beyond the United States - but the most likely destination for much of that oil is California. Faced with declining production from Latin America and rising prices for higher-grade crudes from the Middle East, the Golden State is importing more oil from Canada - much of it via the Trans Mountain pipeline, which Kinder Morgan Canada last month sold to Ottawa for C$4.5 billion ($3.5 billion). Port Manatee holds promise as a trade gateway for German companies, according to Germany’s Miami-based consul general, who visited the Florida Gulf Coast port Thursday [March 15]. 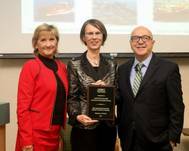 “Port Manatee is an important part of Florida infrastructure,” said Annette Klein, Germany’s consul general for Florida, Puerto Rico and the U.S. Virgin Islands. “As German companies look for a U.S. port to meet their needs, it is important for us to be aware of such ports and their capabilities and objectives. DP World, one of the world's largest port operators, said on Thursday full-year profit rose 14.9 percent in 2017 and that it would spend $1.4 billion on capital expenditure this year. Profit for the period attributable to owners of the company after separately disclosed items rose to $1.18 billion in 2017 from $1.02 billion in 2016, DP World said in a bourse statement. Revenue increased 13.2 percent to $4.7 billion and the board recommended increasing the dividend by 7.9 percent to $340.3 million at 41 cents per share. DP World is planning to annually inject up to $1 billion in global investments until 2020, local media quoted company chairman and CEO Sultan Ahmed Bin Sulayem as saying. The expansion at Prince Rupert in Canada opened for business. DP World Limassol in Cyprus opened a new cruise terminal. A series of acquisitions, technology tie-ups and sustainable business achievements all formed part of the activities that saw the global trade enabler expand its business horizons across the world. DP World has completed the acquisition of an additional 66.67% stake in Empresa Brasileira de Terminais Portuários (Embraport) in Brazil from Odebrecht Transport (OTP). This transaction increases DP World’s shareholding to 100% and the terminal will be rebranded to DP World Santos. DP World Santos is the largest Brazilian private multi-modal port terminal and operates in the Port of Santos, which is the busiest container port in Latin America handling 3.4m TEU in 2016 and has strategic access to sea, road and rail, and 90% of the cargo is destined for Brazil’s most populous city, São Paulo. Florida International Terminal (FIT), the SAAM-operated terminal in Port Everglades-Fort Lauderdale (U.S.), welcomed the Maersk Winnipeg, marking the first call by the new Sealand SAE service. The service is a weekly route between South Florida, Honduras and Guatemala and also offers inland transfers from/to Nicaragua and El Salvador. FIT is one of eleven terminals where SAAM has an ownership interest in the Americas. It holds the operating concession until 2025 (with a 5+5 extension option) and in 2016 reported container port throughput of more than 202 thousand TEUs. The President of Ecuador Lenín Moreno and DP World Group Chairman and CEO, Sultan Ahmed Bin Sulayem today performed a ground-breaking ceremony to mark the start of construction of the greenfield multi-purpose port project at Posorja, Ecuador. The ceremony follows the 50-year concession the company won last year from the Government of Ecuador to build a facility with 750,000 TEU (twenty-foot container equivalent) of capacity to fuel the country’s economic growth and connect it with international markets. The Port of Corpus Christi lives up to its moniker ‘Energy Port of the Americas,’ as the movement of energy in and out dominates the port’s history and future. John P. LaRue, Executive Director, Port Corpus Christi recently visited Maritime Logistics Professional’s headquarters in New York City to discuss the nearly $50 billion in investment projects driving the port forward. “Let’s just start with what we are and what we are not,” said LaRue. “We are not a container port. Up until a few years ago we were an oil import port (serving) three refineries: Citgo, Valero and Flint Hills Resources. 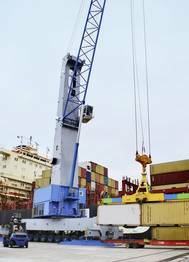 Florida International Terminal (FIT), operated by SAAM in Port Everglades - Fort Lauderdale (Florida, U.S.A.) acquired two new reach stackers Taylor model XRS-9972, a North American firm. The terminal now has 15 container handlers. The arrival of this new equipment is part of the company’s fleet renovation plan that started in 2015. “With this, we seek to continue strengthening the terminal’s handling capacity to provide better and more efficient service to our clients,” explained FIT VP and CEO, Klaus Stadthagen.